The dental drill is a tool used by dentists to bore through tooth enamel as well as to clean and remove plaque from the tooth's surface. It is composed primarily of a handpiece, an air turbine, and a tungsten carbide drill bit. Since its development began in the mid 1700s, the dental drill has revolutionized the field of dentistry. The modern dental drill has enabled dentists to work more quickly and accurately than ever before, with less pain for the patient. The teeth are composed of both living and nonliving tissue. The soft tissue inner layer, called the dentin, is similar in composition to skeletal bones. Enamel, the outer layer of teeth, which is highly calcified and harder than bone, cannot be regenerated by the body. Tooth decay, which damages to the enamel, is caused by various oral bacteria. One type of bacteria that resides in the mouth breaks down residual food particles that remain on teeth after eating. A byproduct of this bacteria's metabolism is plaque. Other bacteria attach themselves to this plaque and begin secreting an acid which causes small holes to form in the tooth enamel. This allows still other types of bacteria to enter these holes and crevices and erode the softer tissue below. The process weakens the tooth by creating a cavity. The breakdown of the soft tissue is responsible for the pain that is typically associated with cavities. Beyond the initial holes, the outer enamel is left primarily intact. Untreated, cavities can result in diseases such as dental caries and abscesses. To prevent these diseases, dentists use a dental drill or other tools to remove the plaque from a cavity. As the tooth is drilled, the tiny diamond chips that cover its tip wear away the plaque and damaged enamel. Only by drilling into a tooth can dentists' ensure that all of the plaque is removed. With the plaque gone from the teeth, the enamel-damaging bacteria have nowhere to reside and cannot cause cavities. After the drilling is complete, the hole that is left is filled with a suitable material which strengthens the tooth and helps prevent further damage. The earliest examples of dental drills were developed by the Mayans over 1,000 years ago. They used a stone tool made of jade, which was shaped as a long tube and sharpened on the end. By twirling it between the palms, a hole could be drilled into the teeth. They used this tool primarily in conjunction with a religious ritual for putting jewels in the teeth. Though this technology was ahead of its time, it was not known throughout the rest of the world. The early Greek, Roman, and Jewish civilizations also developed versions of a dental drill. While these early examples of tooth drilling are found, during the Middle Ages the technology was lost. In the mid 1600s, doctors discovered that temporary relief from dental diseases could be achieved by filling the natural holes in teeth with various substances. These early dentists even used a chisel to chip away bits of the damaged enamel. However, it was not until Pierre Fauchard came on the scene that dental drill technology was rediscovered. 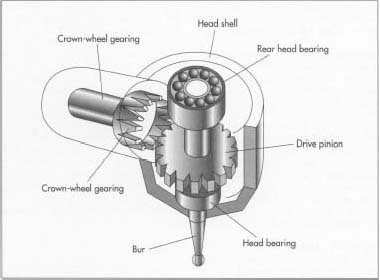 Diagram of a dental drill. Although individual drills can vary in design, they all include a motor, handpiece, couplings, and a drill bit, or bur. a bow that was used to power it. During this time, many innovations were developed. One of these was the 1778 introduction of a near-mechanical drill, which was powered by a hand crank that activated a rotating gear. Soon afterward, an inventor added a spinning wheel to power the drill head. The motion in this device was created by the dentist pushing a foot pedal to move a spinning wheel, which in turn moved the drill head. Other attempts at mechanical drills were made during the 1800s, but they were hard to handle and inefficient, so most dentists used simple, hand-operated steel drills. Drill technology steadily improved over time, resulting in faster and more efficient drills. New types of foot-powered engines were attached to dental drills by 1870. Electrically powered drills soon followed, and the time it took to prepare a cavity was decreased from hours to less than 10 minutes. High speed drills were developed in 1911, but it was not until 1953 that the modern dental drill with its air turbine engine was introduced. These drills were over 100 times faster than their predecessors and significantly reduced the pain associated with tooth drilling. To accommodate these faster speeds, tungsten carbide drill bits were introduced. Since then, manufacturers have made many modifications, such as adding fiber optic lights and cameras, incorporating sophisticated cooling systems, and making highly durable handpieces. There are various designs of dental drills available, however, each have the same basic features, including motors, a handpiece, couplings, and a drill bit. The high speed drilling is activated by an air turbine. These devices convert highly pressurized air into mechanical energy, enabling drill bits to rotate over 300,000 rpms. Slower speeds are also necessary for things such as polishing, finishing, and soft tissue drilling, so dental drills are typically equipped with secondary motors. Common types include electric motors and air-driven motors. The handpiece is typically a slender, tube-shaped device which connects the drill bit with the driving motor. It is often light-weight and ergonomically designed. It also has an E-shaped attachment that ensures that the drill bit is properly angled for maximum system stability. These components of the dental drill were once quite delicate. However, recent health concerns have forced designers to develop handpieces that can withstand high-pressure steam sterilization. The couplings are used to connect the drill unit to the electric or air power sources and cooling water. They can either consist of two or four holes, depending on the type of fitting. The drill bit, or bur, is the most important part of the dental drill. It is short and highly durable, able to withstand high speed rotation and the heat that is subsequently generated. Many bur shapes are manufactured, each with varying cutting and drilling abilities. Some burs are even designed with diamond cutting flutes. Additional features may be added, such as coolant spray systems or illumination devices. The most sophisticated dental drill has an internal cooling system, an epicyclic speed-increasing gearbox, and fiberoptic illumination. Dental drills are constructed from a variety of raw materials, including metals and polymers. The handpiece, which houses the motors, gears, and drive shaft, can be made from either lightweight, hard plastics or metal alloys such as brass. The most advanced handpieces are made with titanium. The bur is made of tungsten carbide, one of the hardest substances known. Other materials such as steel are used for the internal motors. The tubing that connects the drill to the main power sources is made of a flexible material, such as polymeric silicone or polyvinyl chloride (PVC). The production of a dental drill is an integrated process in which individual components are first made and then assembled to make the final product. While manufacturers could make each part individually, they usually depend on outside suppliers for many of the parts. A typical production method would include constructing the motors and the drill bits, forming the handpiece, final assembly, and packaging. 1 Although numerous designs and materials are used to make the handpiece, they are all typically made using a pre-formed mold. For plastic handpieces, this involves injection molding, a process in which the plastic is melted, injected into a mold, and released after it forms. Metal handpieces also use a similar molding process. 2 The drill bits are formed from tungsten carbide particles. They are made by first taking tungsten ore and chemically processing it to produce tungsten oxides. Hydrogen is then added to the system to remove the oxygen, resulting in a fine tungsten metal powder. This powder is then blended with carbon and heated, producing tungsten carbide particles of varying sizes. These particles are further processed to form the appropriately shaped drill bit. 3 The air turbine engine is constructed from small steel components. In one design, the turbine is sandwiched between two sets of ball raced bearings and connected directly to the drill bit. The entire unit is encased in the drill head, with openings for incoming air and exhaust air. 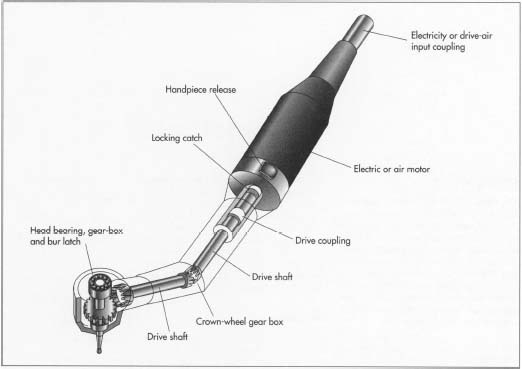 Other types of turbine engines are farther up in the handpiece and are connected to the drill bit by a series of driveshafts and gears. more complex, consisting of a set of bearings, magnets, brushes, and armature coils. 5 After all the components are available, final assembly can begin. Depending on the design, the air turbine can be placed directly into casing of the handpiece or it can be attached along with the drill bit. The other parts of the drill are put into the handpiece, including air or electric motors, driveshaft, gears, and control switches. Other accessories are added, such as the cooling hoses and fiber optic lighting devices. The coupler is placed on one end of the handpiece, and the drill bit is attached to the other. 6 After an array of quality checks, the finished drills are placed in the appropriate packaging, along with accessories, manuals, and replacement parts, and are then shipped to distributors. The quality of each drill component is checked during each stage of manufacturing. Since many parts are made each day, inspecting all of them is impossible. Therefore, line inspectors typically take random samples at certain time intervals and check to ensure that those samples meet set specifications for size, shape, and consistency. During this phase of quality control, the primary testing method is visual inspection, although more rigorous measurements can also be made. During much of the developmental history of the dental drill, the focus of research had been on increasing the speed of the drill bits and correcting the problems related to these greater speeds. However, studies have shown that there is no benefit to increasing the drill bit speed any higher than it is today. Therefore, the focus of research has shifted to developing altematives to conventional drills altogether. Two recent introductions are noteworthy and may be indicative of the direction dentistry is headed. A new method of treating cavities is known as "air-abrasive" technology. Using this technique, a dentist blasts away parts of the tooth surface without using a drill. Small particles of alumina are forced by a stream of air, and the plaque is literally knocked off the tooth. Another technology that may replace the dental drill is the laser. The FDA has recently approved the use of a laser drill for use on the soft tissue of teeth. However, approval for use on hard tissue is pending. This technology may allow for quicker and more accurate drilling. The result of both of these new technologies is optimal patient comfort as the pain and noise associated with conventional drilling are eliminated. Jedynakiewicz, Nicolas. A Practical Guide to Technology in Dentistry. Wolfe Publishing, 1992. Glenner, Richard, Audrey Davis, and Stanley Burns. The American Dentist. Pictorial Histories Publishing Co., 1990. Simonsen, Richard. Dentistry in the 21st Century A Global Perspective. Quintessence Publishing Co., 1989. Ring, Malvin. "Behind the Dentist's Drill." Invention & Technology, Fall 1995, pp. 25-31.